What’s the problem, scientifically speaking? While hematopoietic stem and progenitor cells (HSPCs) have great potential for development into cell-based therapeutics, they are very difficult to transduce. This technical problem has slowed researchers’ ability to turn HSPCs into the next generation of medicines. What have been the technical barriers? The problem with transducing HSPCs has been with the viral transduction systems. 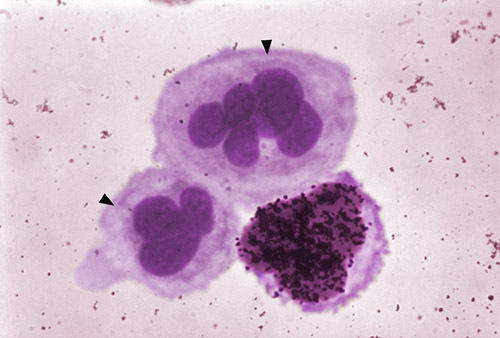 Most lentivirus systems are pseudotyped with VSV-G, an envelope protein from the vesicular stomatitis virus that enables recognition and viral entry into a broad range of cell types. Using this approach, creating lentiviruses pseudotyped with a viral protein that recognizes HSPCs, such as the measles virus hemagglutinin (H) and fusion (F) glycoproteins, should result in high transduction, which it does. Unfortunately, HEK293T cells only produce low titers of the H/F lentivirus, reducing the effectiveness of this approach. One important cause of the low efficacy is the production of cytotoxic contaminants from the producer cells. Ozog, et al. have now overcome this difficulty by creating a HEK293T cell line that can produce high-titer H/F lentivirus. Ozog, et al. made two major contributions. First, they found that by producing the new strain in CD46 null cells, vector titer increased. Next, they dove into the mechanisms for vector production, and found that their method reduces cell toxicity improves transduction efficacy. Careful attention to the molecular mechanisms at play in vector production revealed a way to unlock the potential of a pseudotyping that hasn’t worked up to this point. Azure antibodies, the c600 imaging system, and AzureSpot analysis software helped to produce and quantify the western blot signal to confirm that producing lentivirus in CD46 null cells improves vector purity. Clean vector production of the better pseudotyped virus is now possible, without the contamination that was a barrier with previous methods. This advance made by Ozog, et al. will greatly enhance the ability of researchers to develop HSPCs into therapeutics. Azure is excited that our products contributed to this successful project. Whether you’re developing cutting edge technology, like Ozog, et al., or doing basic research, our Western blotting imagers and reagents can simplify workflows and deliver quality results. The c600® delivers outstanding sensitivity for fluorescent Western blotting with up to three color detection.